At Flamboyan, we work to catalyze and motivate educators, education leaders, organizations, and systems to practice, scale, and support family engagement practices that improve outcomes for all children. Our teacher and leader trainings are led – mostly led by a cadre of teacher and parent trainers. Educators lean about effective family engagement practices while exploring their assumptions about students and families to deepen their understanding how systems of inequity impact their students. We work with a wide-range of partners to train teachers and educators including alternative certification programs, school districts, and nonprofit organizations. At Flamboyan, we understand that no one can speak to the family engagement experience better than parents and teachers themselves. That’s why we employ a training cadre of families and teachers who pair up to conduct our family engagement trainings. Our trainers understand what a commitment to effective and equitable family engagement looks like (and what it doesn’t!) and are eager to share their experience as they train teachers across the country on how to create a culture of family engagement in their classrooms. 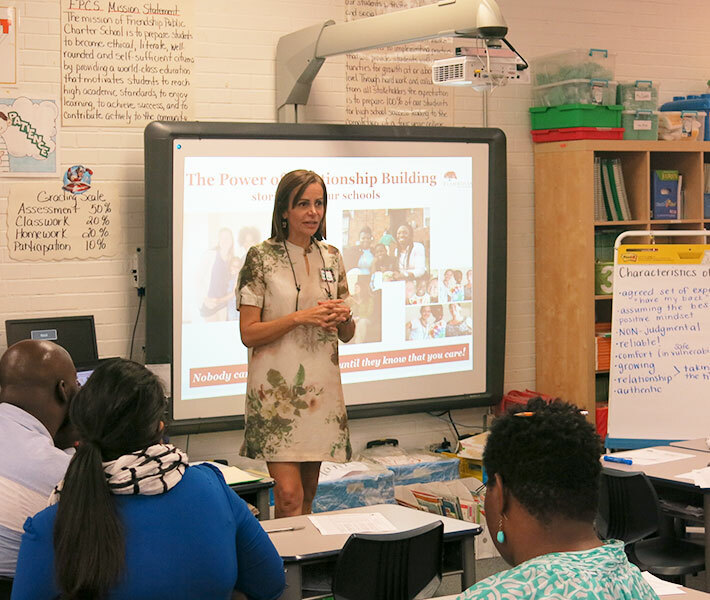 Flamboyan has partnered with the DCPS Office of Family and Public Engagement since 2013 to facilitate family engagement training for aspiring school leaders through the Mary Jane Patterson Fellowship — an internal leadership pipeline dedicated to fulfilling the need for dynamic instructional leaders in DCPS schools. Flamboyan co-facilitates a five-session learning experience for the Mary Jane Patterson Fellows where they learn practical strategies for leading family engagement in their schools. The Capital Teaching Residency is an alternative teacher certification program managed by the KIPP DC charter school network that aims to empower students and increase their access to quality educational opportunities by creating a talent pipeline of highly effective teachers in D.C.; retaining highly effective teachers in D.C. public and public charter schools; and shaping high-quality teacher preparation programs nationally. Flamboyan has partnered with the Capital Teaching Residency to train residents in effective family engagement strategies since the 2014-2015 school year. Urban Teachers is an alternative teacher certification program that offers high-need schools in Baltimore, MD and Washington, D.C. a pipeline of effective teachers. Participants commit to a four-year teacher preparation program that includes a residency year and three fellowship years teaching full time in a high-need urban school. Flamboyan has partnered with Urban Teachers in D.C. since the 2012-2013 school year, when it trained the first cohort of residents and fellows in effective family engagement practices. The KIPP Fellowship in Special Education is a year-long professional development program where participants earn their certification in special education, receive intensive in-classroom coaching, and improve their ability to meet the needs of all students who walk through their classroom door. Flamboyan has partnered with the KIPP Fellowship in Special Education since 2016-2017. AppleTree’s mission is to close the achievement gap before children enter kindergarten. The AppleTree Early Learning Teacher Residency is an innovative approach designed to prepare Residents for a career in teaching through hands-on experiences in the classroom. Flamboyan has partnered with the AppleTree Early Learning Teacher Residency since 2016-2017. The work I’ve done with Flamboyan has completely changed my teaching practice. Relationships are at the forefront of everything that I do as a teacher. In order for students to be successful, they need to trust their teachers. The trust that I’ve established with my students is a result of the trusting relationships I’ve built with their families.